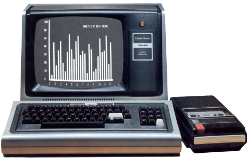 If you are on Twitter, follow TRS-80 Trash Talk for all Tweets TRS-80. I never was fond of the trash label but these guys are firing on all cylinders, going all the way to 65535, if you know what I mean. They also produce a podcast and just interviewed Scott Adams on August 25. At time of posting their latest podcast is from August 3rd but check regularly for their latest.